African Pride Melrose Arch is an executive meeting and conference facility conveniently located in the chic Melrose Arch Lifestyle Development in Johannesburg, South Africa. 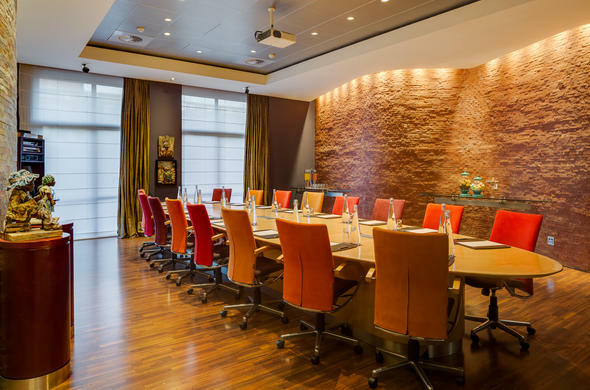 African Pride Melrose Arch Hotel Business Centre is the ideal setting for sophisticated executive events and meetings. Each meeting room is quipped with state-of-the-art audio-visual equipment. Adorned with original artworks, the inspiring workspaces are designed to offer a unique ambience for every corporate gathering. Each of our five executive boardrooms is fully equipped with advanced audio-visual equipment for a seamless conference experience. For added convenience, full secretarial and business services are also available 24 hours a day. The naturally-lit atrium serves as the perfect break area, while the dedicated Banqueting TEAM is on hand to cater to your every need. Guests can also adjourn to the poolside for a tea break, or savour a gourmet lunch or dinner at the stylish March Restaurant and Library Bar.